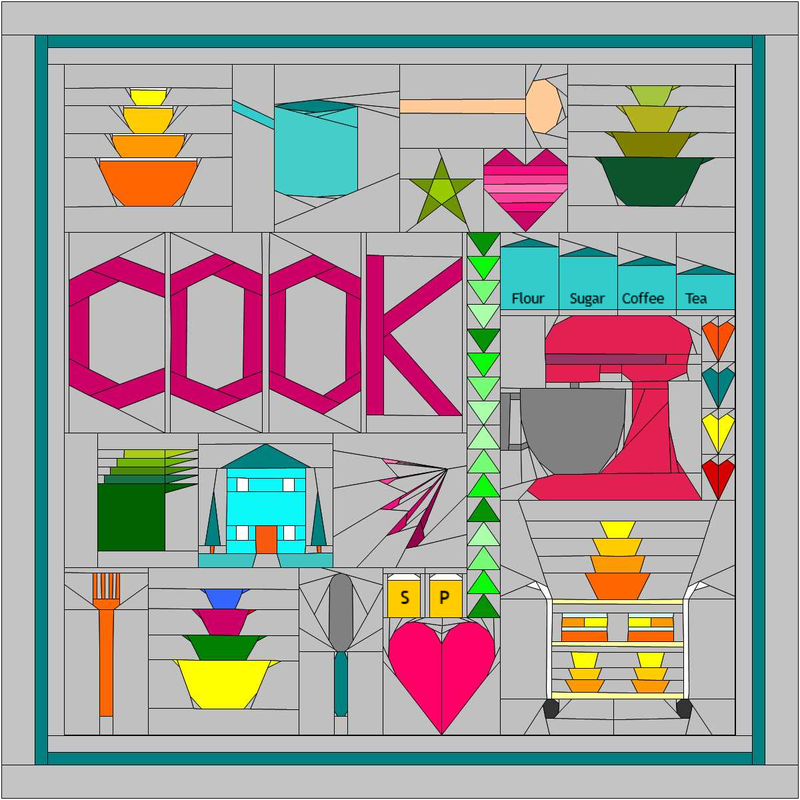 Today starts the final link up party for our Good Fortune mystery quilt. 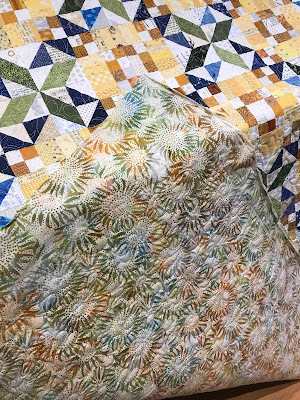 You can see all the wonderful finishes at the Quiltville blog HERE. I managed to finish mine up over the weekend and took a couple of photos of it today. 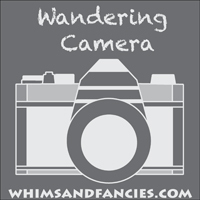 It has been such a rainy season here so I haven't had a chance to get an outdoor shot until today. After adding an additional 6 inch strip border, the quilt finished at 84" square. The quilting is fairly dense since that last border has a lot of bias edged strips when sewn together. I love seeing all the texture after quilting. The backing had the perfect colors. Blue seemed like the best option when it came to binding. It was a great pattern this year. 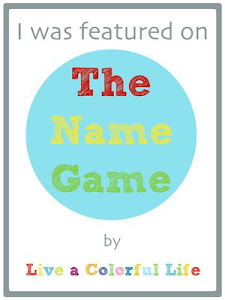 I can hardly wait for the next clue in about nine months. It has been really cold here lately. 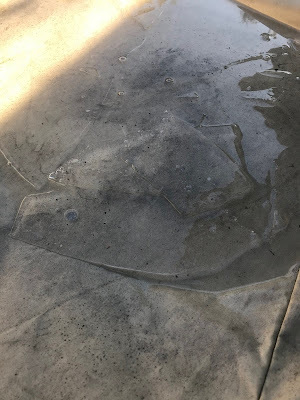 We've had very rare freeze warnings. I'm finding myself covering my tender plants each night. Where is spring? 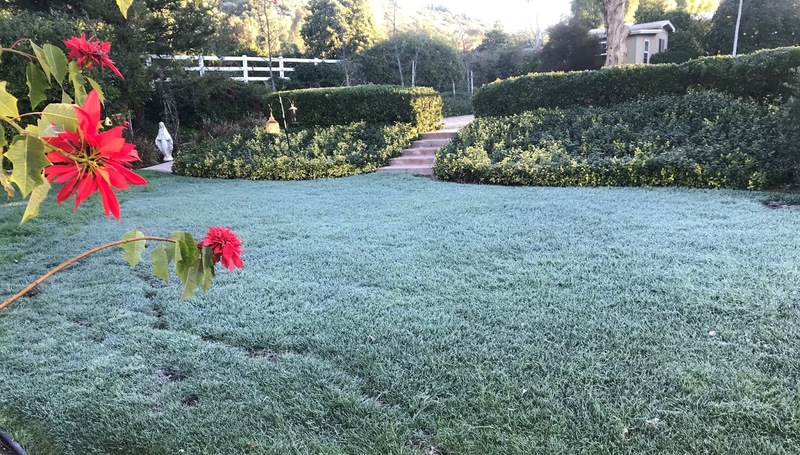 This morning we awoke to another day of frosty lawns and ice in the rain puddles from yesterday. 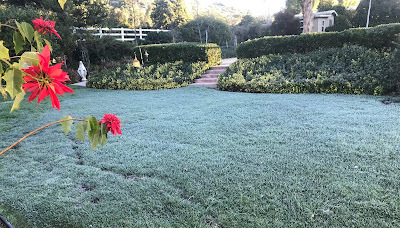 Those poinsettias are frost damaged today and will be gone tomorrow. Your Good Fortune quilt is so very beautiful, Mary. 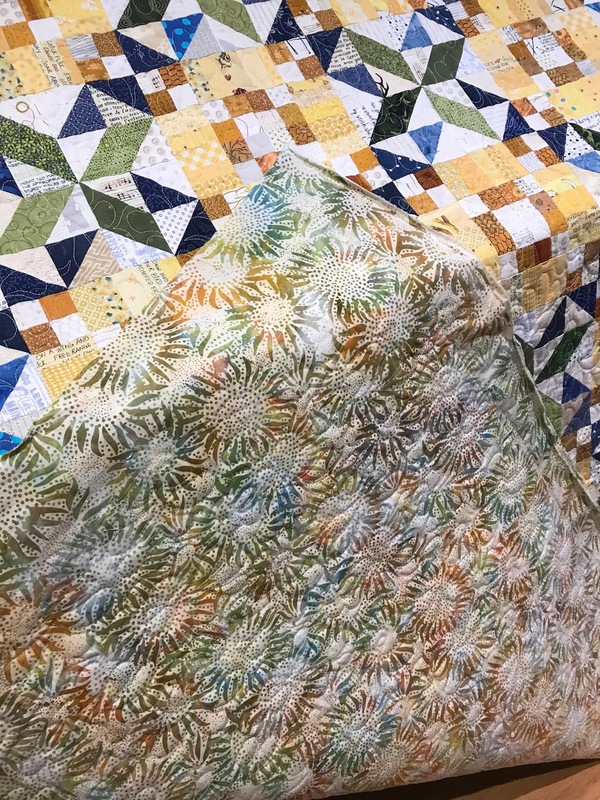 I too love all that texture with the dense quilting and the border fabric is inspired. Yes, blue was a most excellent choice for the binding and the backing fabric is perfect. A most amazing finish! 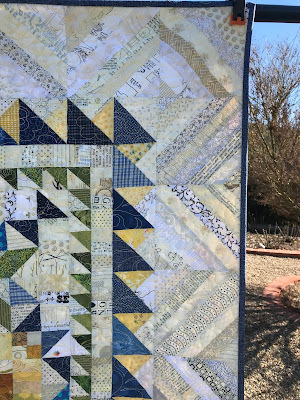 And....I must say the blue, blue sky is the perfect backdrop for your gorgeous quilt! I hope it warms up there soon. Good Fortune turned out beautifully. That back is perfect. Love the circles in all the colors that are on the front! Good job! I hope your plants survive the cold. Spring seems very far away. We keep getting snow. Your Good Fortune is gorgeous! I love the neutral string blocks border, it frames the rest of the top beautifully. The backing fabric is perfect too, love it all! Ice and snow in the forecast for tomorrow, continuing winter here. Hard to even think spring quite yet. Love your quilt and the back was an excellent choice. We had snow and I was drifted in. My husband spend the day digging us out but we are already drifted in again. So I will be working from home again tomorrow. I just love the colors you chose for this - beautiful backing, too. 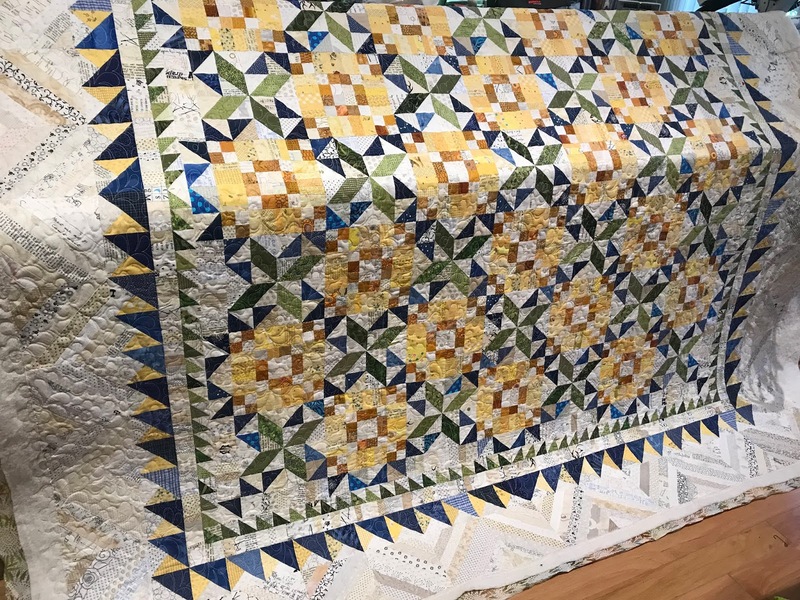 A lot of bias thruout that pattern so well done on the quilting. Beautiful, love the colours and the neutral border. It's absolutely gorgeous, Mary! I love the extra string border. Congrats on your beautiful finish. Hope the sun starts to shine more and more for you out west. Spring will be here soon. Good Fortune is gorgeous Mary.. Fabulous quilting and I love your backing fabric.. So beautiful,Mary! Love the Fabrics you used. Cold here also, with lots of snow for tomorrow! Gorgeous! Congratulations on an amazing finish! 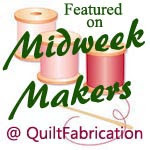 Very soft and pretty colors for your quilt! 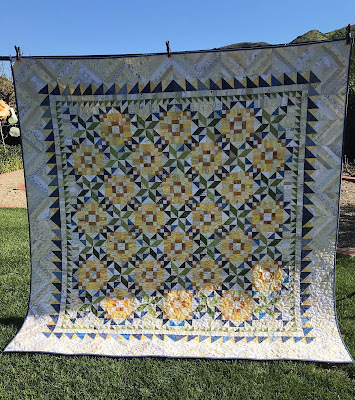 The extra border looks great and will make the quilt more practical. Beautiful! Love the pieced border too. I just love your colors in good Fortune! Great job on the finishing. And oh, that backing fabric, gorgeous!! Just beautifu! Love your colorway and that string border is genius! Great backing choice too. Oh my gosh this is beautiful and the backing fabric is so perfect. A beautiful finish, Mary. 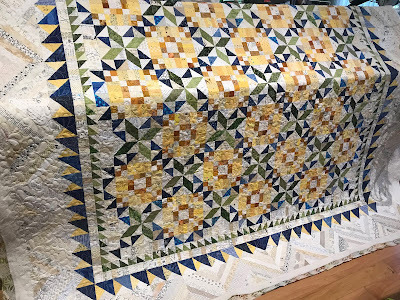 The extra border makes it a good size, and frames and complements the complex piecing of the centre. Your frost is surprising! Spring must be on its way to you though, as things have cooled down here a little bit lately. The sun is heading back to your side of the world. You are much colder there than we are, as we have no ice anywhere. My lettuce shivers regularly, but the blood oranges out here are a delicious shade of rosy chocolate because of the cold. I'm on the hunt for some tomorrow (my friend showed me hers). What a fantastic finish!! Love it! Your quilt looks great! I love that extra final border. It’s nice to see one without orange - it makes your quilt unique. I'm always in awe when I see your quilt projects. There's such detail in this quilt...gorgeous! Wow, lots of icy spots and it looks so cold. We've had lots of rain, but no snow yet. Wow! That is what came to my mind when I saw your completed quilt. It is a beautiful quilt, so much detail. We have had more snow and cold than usual, looking forward to a bit more sunshine. Absolutely amazing! 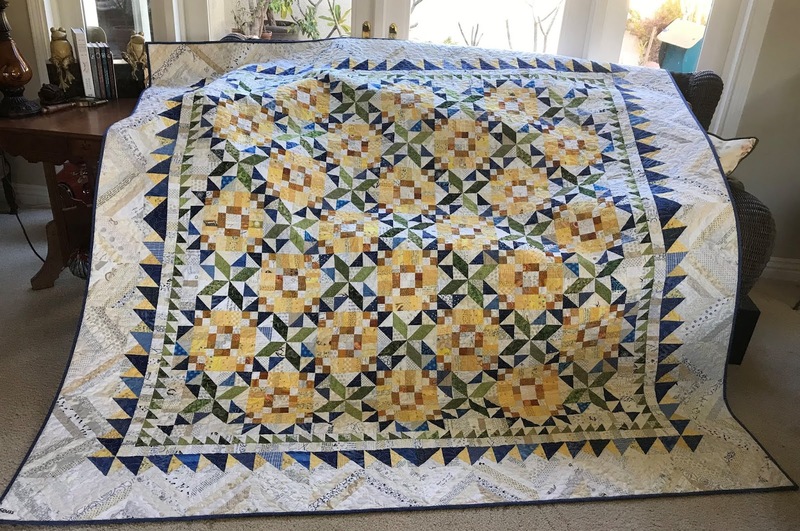 The borders must have been a lot of work and they frame the quilt so beautifully, great backing fabric and blue binding could not be more perfect. Beautiful finish, Mary!! Really beautiful! 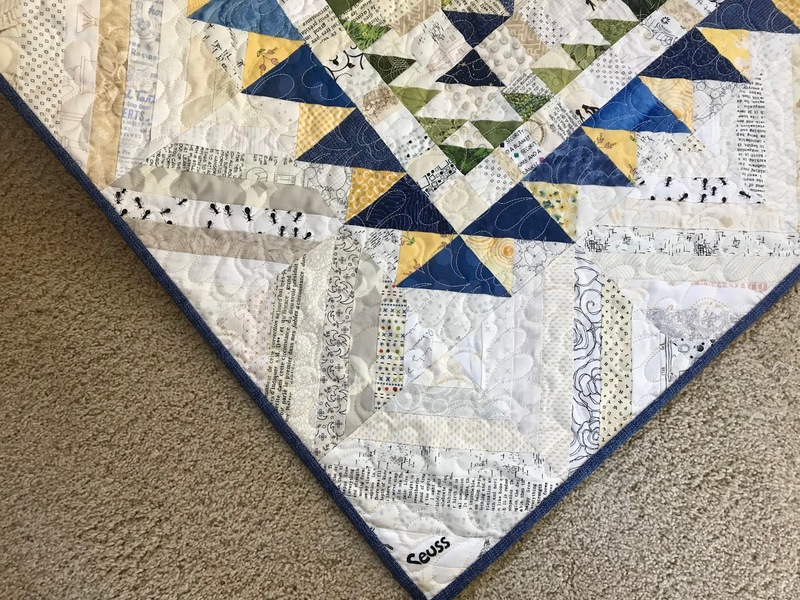 Your good fortune quilt turned out gorgeous. Love the colors you used. It is absolutely gorgeous! I linked back to the other finishes, and while I love many of the borders, I honestly prefer yours. It just seems to frame it perfectly.